A great 144Hz 32-inch gaming monitor with adaptive sync and some added HDR goodness. High Dynamic Range or HDR is surely the hottest thing in display technology right now. But not all HDR technology is equal. In fact, there are competing standards, even competing notions, of what it means to be an HDR PC monitor or TV. 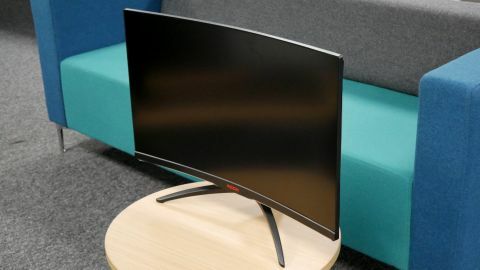 Enter the new AOC Agon AG322QC4. It’s absolutely jam-packed full of features. It supports refresh rates at its native resolution up to 144Hz, for instance, has a 32-inch curved panel and adaptive sync capability. In many ways, it’s a dream monitor for gamers and performance PC enthusiasts. Despite all that, it’s the AG322QC4’s support for HDR that both sets it apart and arguably defines this monitor. Specifically, it offers VESA DisplayHDR 400 certification and is one of the first monitors to do so. So, what exactly does that mean, does it make a tangible difference to the display experience and is worth a price premium? Of course, this new AOC isn’t unique. On paper, it’s a dead ringer for the BenQ EX3203R, which we reviewed recently. That sets expectations in terms of what to expect from this display in general and also in terms of its HDR capability. At £400 in the UK and $549 Stateside (Australian pricing currently isn’t available), you can take two views on the AOC Agon AG322QC4’s price. On the one hand, it’s not exactly a bargain given its middling 1440p native resolution and 32-inch panel size. AOC itself will sell you the CQ32G1, which matches this monitor for size, resolution and refresh rates for just $399 (around £300, AU$560). On the other, the new HDR-capable AG322QC4 undercuts the very similar BenQ EX3203R by triple digits. As a member of AOC’s Agon range of monitors, the AG322QC4 is targeted squarely at gamers. That’s reflected in both the look and the feature set. Design-wise, you get nice, slim bezels on three sides of the panel, sleek all-round styling and some funky red backlit LEDs along the bottom bezel. AOC has also included its signature plug-in controller. It looks a little like a multi-button mouse and makes access to the screen’s on-screen menu quick and easy. That’s handy given AOC is generous with the gamer-friendly options, including the ability to toggle multiple both levels of pixel overdrive and a low-lag mode, which gamers will welcome. The panel’s HDR functionality is also accessible through the controller. Speaking of the panel, it sports a 1800R curvature, which many will find adds to gaming immersion, and VA technology. The latter tends to improve contrast and colors, but typically isn’t the fastest of LCD technologies. Elsewhere, the core feature set is likewise right up most gamers’ alley. There’s the 2,560 by 1,440 pixel native resolution, 144Hz refresh and support for the latest second-generation iteration of AMD’s Freesync adaptive sync technology. In fact, the only notable omission is support for USB-C connectivity. For most gamers, most of the time, that’s not a major issue. However, USB-C is rapidly becoming the most convenient and effective display connection for the PC, so it’s a bit of a pity not to have it included here. Just as with the BenQ EX3203R, the key point to note is that this AOC monitor’s compliance with the VESA DisplayHDR 400 standard needs some qualification. As the name suggests, DisplayHDR 400 only requires peak brightness of 400cd/m2. Other HDR standards require not only much higher brightness up to 1,000cd/m2, but also local dimming, which isn’t supported by this monitor. Likewise, DisplayHDR 400 comes with less stringent demands in terms of color reproduction than other HDR standards. As we concluded with the BenQ EX3203R, DisplayHDR 400 is best viewed as something akin to HDR lite, rather than being full blown HDR. HDR-related caveats duly noted, we can take the AOC Agon AG322QC4 on its merits which, for the most part, are numerous. The 32-inch VA panel is quoted at 3,000:1 for static contrast and that translates into really nice, inky black tones and excellent contrast. You won’t, likewise, be left wanting for vibrancy and color saturation with this screen. It’s punchy. The factory calibration is decent, too, so you get all that vibrancy and contrast along with plenty of detail at both ends of the brightness scale. Compression isn’t an issue. The user-defined overdrive function works well, too. Some inverse ghosting is visible in its fastest setting. But set to medium, the pace of the panel is decent (though not as nippy as the best TN gaming monitors) and there’s little to no visible ghosting. The combination of 144Hz refresh and adaptive sync is as welcome as ever. Once you’ve experienced the smoothness of a high refresh monitor, it’s painful going back to a standard 60Hz monitor. As for that DisplayHDR 400 capability, it arguable whether this monitor delivers a true HDR experience. It feels more like a really punchy SDR monitor than a true HDR display. But it’s inevitable that the line between SDR and HDR is a little blurred at the margins. It’s also worth noting the impact of the AG322QC4’s 2,560 by 1,440 native resolution. It’s a plus for gaming because it allows for lower loads on your graphics subsystem than, say, a 4K monitor. That means higher frame rates, smoother gaming and a more responsive feel. On the downside, it’s not a particularly high resolution for such a large monitor, so the pixels are pretty big and ugly in a desktop and font-rendering context and you have a lot less room to work with than a 4K panel. AOC has delivered on the Agon AG322QC4’s gaming remit pretty nicely. It’s quick enough, it’s super smooth and it produces some pretty fantastic visuals. Arguably, it doesn’t really deliver a full HDR experience. But its support for what you might call the entry-level VESA DisplayHDR 400 standard does ensure that you get a very punchy overall image compared to conventional SDR monitors and you get all that for a reasonable overall price. Even bearing in mind that this isn’t a monitor designed for productivity, its gaming-centric remit does come at a cost in terms of pixel density and desktop real-estate. If you’re looking for an all-rounder, therefore, you may prefer something with a full 4K pixel grid.